Closure. That’s all Kathe Swanson was looking for. She was the city clerk of Dixon, Illinois, when in October 2011 she discovered some fishy bank statements that implicated longtime comptroller, Rita Crundwell, for embezzling from Dixon. 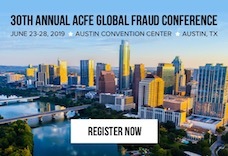 After receiving the ACFE’s Sentinel Award during Wednesday’s closing general session of the 29th Annual ACFE Global Fraud Conference, Swanson said, “I have finally received my closure,” as supportive attendees gave her a standing ovation.